I find that the simplest dishes in a restaurant are the ones to order with trepidation. That's because with few components and procedures performed on them, one has few areas to hide flaws in the execution. Take for example, the steak. One of the most expensive items regularly featured in restaurant menus, it is also one of the simplest: a piece of meat and some dry heat. Yet the fine line between perfectly cooked and ruined is at once blurry and easy crossed. 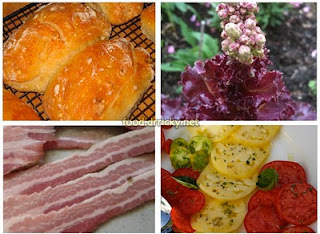 Which is why this blog post comparing BLTs (bacon, lettuce and tomato sandwiches) on the Houston Press Eating Our Words blog puzzled me a bit. The great thing about a BLT is its inherent simplicity - it only has five components, two of which aren't even cooked. But the sum is a blissful enhancement over the parts. Instead, the specimens highlighted chose to use the BLT not as the highlight of the dish, but rather as a canvas, lashing it with such distractions as a thick layer of egg salad or loads of shrimp. It may wow some folks, but but I interpret it as a ploy to hide the flaws in the BLT components. A year ago, Michael Ruhlman launched a challenge to make a BLT from scratch. It's a return to fundamentals of that symphonic melange from carefully cured meat, home baked bread, fresh vegetables, and wondrous mayonnaise prepared apart from the industrial process. The winners were an amalgamation of creativity (a BLT pie!) to bordering on admirably absurd (grand winner made his own salt). But these did not distract from the essence of a BLT. And that's the key. Too often in Houston restaurants (maybe in American restaurants in general), the base components of a BLT - bacon, lettuce, tomato, bread, and mayonnaise - are seen as side additions to some other main dish - a burger, perhaps. The genius behind a BLT sandwich is that when each is chosen, prepared, and assembled with care, the result is a sandwich worthy of being a classic.